With this simple example you can quick start with spring-data-jpa. This project has minimalistic design and focused to make easy to understand. What is spring-data-jpa for actually? I used in-memory database for this example to simplify, so no need for any database setup. This is a standalone application to minimize all dependencies for this example. We will first look into our pom.xml file for all the required dependencies and their versions. We have used Spring 4, and Hibernate 4 in this example. We need spring-context and spring-orm for Spring dependencies. We use hibernate-entitymanager for using Hibernate as a JPA Vendor. hibernate-entitymanager is dependent to hibernate-core this why we don’t have to put hibernate-core in pom.xml explicitly. We have spring-data-jpa, that has different versioning from spring. This module gives us the possibility of using @Repository-s on a clever way. We can use standard JPA annotations for mapping in our model because Hibernate provides JPA implementation. 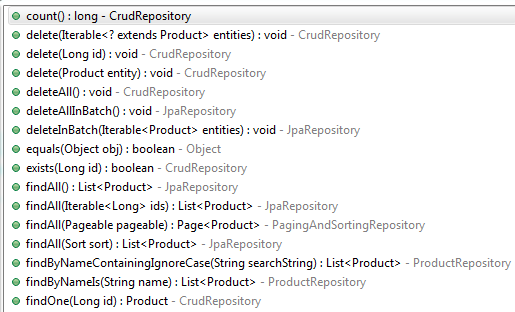 //Default constructor needed for JPA. We use @Entity and @Id JPA annotations to qualify our POJO as an Entity and defining it’s primary key. * This is the Data Access layer. Simple huh? * PLease note that no need for any dao implementation. This is an interface! @Repository annotation is for register this class as a spring repository. This includes also validating @Query contents at bootstrap. In the @Query annotation, we can define a standard JPQL query. * delegate calls to Repository. We call our injected ProductRepository for our service calls. 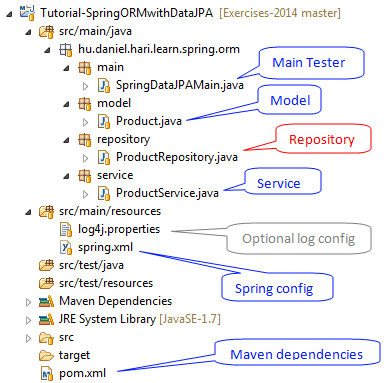 For Spring-DATA-JPA we set the base package of the repositories. Datasource is currently hsqldb (in-memory database). We enable the configuration of transactional behavior based on annotations, and we set the transactionManager we created. Our setup is ready, so let’s write a testing class for our application. * Simple tester for Spring-Data-JPA. You can see how simple we can start the Spring container from a main method, and getting our first dependency injected entry point, the service class instance. ProductDao class reference injected to the ProductService class after the context initialized. After we got ProducService instance, we can test it’s methods, all method call will be transactioned due to Spring’s proxy mechanism. We also test rollback in this example. If you use log4j.properties file from attached source, you can see what’s going on under the hood. nice article. can you please advice how to do the same with 2 data sources.